Once upon a time there was – the L handle and the T handle – which had been around forever and worked OK but had their limitations. So the people at EMKA who understood this considered an alternative approach. – are limited by traditional design thinking in functionality, styling, manufacture and installation. A new approach was needed – manufacturers had sought to address many of these restrictions in the past but what was actually needed was a completely fresh approach – a clean sheet and new ideas. What we now know as the EMKA swinghandle was just such an approach and came to the UK market in the early 1980’s. This new concept took the whole handle into a low profile housing, with the mechanism integral to the escutcheon. Its folding action enabled the protruding handle to be submerged into the body of the lock making it almost flush to the door and subsequently only accessible by key – thus dealing at a stroke with clothing safety, vandalism and transit damage issues. The new thinking embodied in the swinghandle concept freed designers and users to think further about how to deal with issues such as ease of installation, customisation, variants and options, new styling cues and enhanced functions which this new swinghandle configuration now made possible. 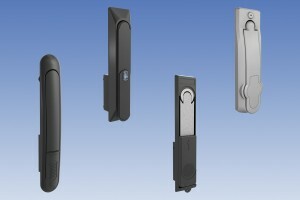 EMKA first introduced two basic models – the 1107 and the 1125 programs with limited options and the UK enclosure market took a liking to these style of handle because of their solid feel when closing the doors, along with their new fresh look. The next 10 years saw limited changes as the popularity of this style of handle grew in the market place – minor developments included twin cylinders for mixed utility enclosures and we saw the combination of a key or insert locking handle together with a padlock facility which became very common in the car manufacturing industry on their machine control panels. But the basic handle established a good sound platform of users and applications so that today these two programs represent the workhorses of the cabinet/enclosure industry – with their modular design approach, which also represented a massive advance over the traditional L and T handle design philosophy. In the following years basic needs have changed little in terms of fitment requirements and interfacing with proven round and flat rod multi-point locking systems, but there have been new handle designs, new mounting possibilities and new lock inserts. 1992 saw the first new introduction with the 2100 series being developed from a customer project requiring a reduced footprint for cabinets to maximise space in server rooms etc with the outside protrusion of the handle being reduced by up to 50%. With this handle we also saw advances in the rod systems to suit this style of locking and the ability to offer flexibility along with cost effective savings with hook rods and twisted rod systems being added to the standard flat rod roller system. The 2100 program took the swinghandle concept a major step forward with minimalist features as well as inside/outside door seal mounts which became a common feature on many of the locking systems offered today by EMKA. The 2100 soon set the standard for a number of enclosure manufacturers – even including an L handle! – and became a common option on many standard enclosures. Along with the development of new rod systems came the requirement to change the handing of the door which led to new hinge developments to match the fixings of the rods and the ability to turn the handles around to suit. By 1994 we saw the first version of the 1150 in its basic two size options for both small and larger enclosures. Customer individuality became more of a driving force than had previously existed and this led to a whole range of new developments culminating in the 1160, 1180 and the 2400 series coming out in the late 1990’s. In the background, there continued to be a steady increase on the options for the 1150 with the requirements for different materials seeing the change from zinc die to include variants in polyamide and then the mix of both with various components being made from different materials combined to make a handle to best suit a customer’s requirement. Again reflecting market need, this process included the development of Stainless Steel swinghandles especially for the UK market. These new ranges brought forward a wealth of new design functionality made possible largely by the integrated modular concept of swinghandle design. This included miniturised versions, digital code locks, shuttered cylinders, padlockables and ultimately electro-mechanical release mechanisms. Ultra-low profile escutcheons were developed which blend smoothly into the door contours and new standards were set in simplified hole punchings and mounting systems to speed and simplify assembly in the production and installation processes. With the 2400 program the cycle as it were came full circle when customers demanded larger exterior handles with the mechanisms moved from behind the door as far as possible while retaining the basic conceptual and practical advantages inherent in the swinghandle approach. With all these new introductions EMKA expected to see a decline in demand for the original 1125 and the 1107 range but were surprised to see that they maintained their market and that the new ranges found additional areas to go into, with the traditional T handle being replaced by the more modern swinghandle which brought in a whole new set of users to the market. Customer innovation continued to stretch the limits of the design with the demand for more individual looks like customer logo and specific colours to suit corporate needs. The introduction of the 1190 Lift Handle saw the first change in the operation of the rod system – moving away from the traditional up-and-down movement from the centre – to a lever handle moving a single rod in one direction thus further narrowing the space required for installation – especially important for multi-point systems mounted outside the sealed area of the door. IP sealing requirements continued to push for greater limits on the amount of components that encroach on the sealed area of the enclosure but to minimise the amount of space required outside the seal to operate the rod system. This in especially drove development of the 2600 which enables the customer to have a limited area for the rods outside the sealed area and all the operating system of the handle on the front of the door with the added option to make the door left or right handed by simply turning the handle over. So far much had been done to maximise the opportunities inherent in this new approach, but by 2000 yet more new demands were on the agenda of specialist cabinet users – in particular the demand for electronic security systems. Systems which would deliver all that integrated computer networks and remote monitoring software could promise. Much research and design initiative took place as EMKA focused on bringing a predominantly mechanical industry into the electronic age. This was accomplished when EMKA introduced single point electronic locking with the development of a solenoid to suit the well established 2100, very quickly followed by the 1180 and the 1154. Rapid development brought a full network solution giving remote monitoring and operation of cabinets within a data centre. This further encompassed customer specific developments, including special handles to include operating keypads for special projects and eventually as a standard. Throughout this period customer loyalty to the 1125 remained and from this followed the requirement to create the electronic version as an easy interchangeable option into the same mounting cut-out. 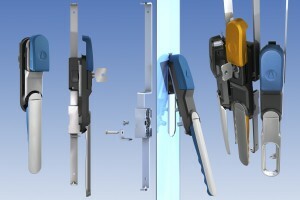 This led to a major development in the 1150 range and with number of options coming through to cover many sorts of hole cut outs already in common use – making the 1150 the most flexible handle in the EMKA range – with a wide variety of options from insert locks, key locks, electronic and even combination locks with all the options needed to interface with the rod systems in a variety of different ways. 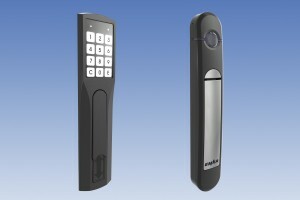 Coming right up to date 21st century requirements have now prompted development of the 3000 series handle with its self contained power supply, its wireless radio key and the ability to interface, wirelessly with the EMKA electronic monitoring system, giving greater control in monitored workshops over machine control access etc. Continuously in parallel with all other concerns there has always been the issue of vandalism – and development of electronic locking systems has given EMKA the ability to leapfrog ahead of the vandals with the vandal resistant 1154 lock program suitable for use on roadside cabinets e.g. for telecoms and proving very successful as well as spawning a purely mechanical variant. We can see therefore that many customer design driven processes and EMKA generated initiatives have trodden a path together over the past approx 30 years. A path culminating in a comprehensive product based solution to the vast range of cabinet security requirements for ever changing application needs – whether standard ex-stock or custom in nature. Share the post "Swinghandles – A customer/manufacturer design interaction"